Welcome to Tuesday night racing at the San Diego Velodrome. Every Tuesday evening, starting basically from Daylight Savings in the spring until the end of Daylight Savings in the fall, 30 to 50 of San Diego’s best bicycle racers, and wannabe best bicycle racers, come to show their stuff on the 330 yard concrete oval. The beginners race on Friday nights. 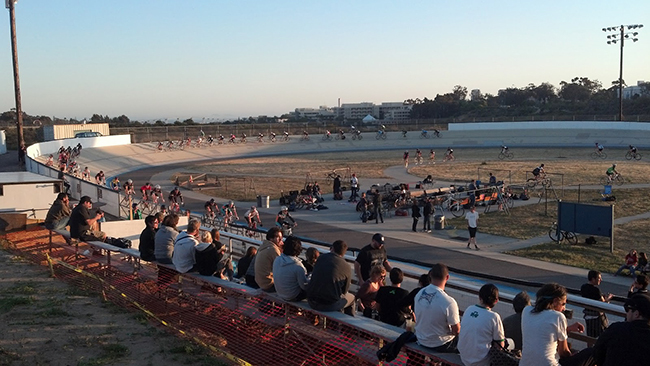 Built in the mid-’70s, the San Diego Velodrome has become one of the best grass-roots racing programs in the country. The San Diego Velodrome Association operates the city-owned facility and conducts the Tuesday and Friday night racing, the training program, and the biannual swap meet. There are worse places to enjoy a bring-your-own pizza and beer or cola on a nice spring or summer night. The racing starts at 6:30 p.m., usually with a moto-paced warm-up. This is an all-hands event with the C, B, and A racers lined up behind a motorcycle whose speed increases bit by bit every few laps until the C-level racers drop off, then the Bs. Then the real racing starts as the remaining As take a few laps at about 32 mph. Depending on the schedule, there are scratch races, point races, madisons, and miss-and-out races. Classic scratch races designate a pre-determined number of laps and the first one across the finish line wins. Point races give points to the leaders of the race at various intervals within the race, such as every five laps in a 30-lap race. The one with the most points wins. Madisons are team races with one racer “throwing” his partner ahead every 30 seconds. The miss-and-out is fun as the last one of the pack each lap is flagged off the course until there are three left who race the final lap to the finish. Because velodrome racing is high-speed, wheel-to-wheel racing (and, oh, did we mention, no brakes?) 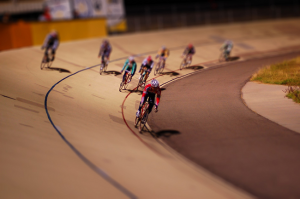 participants must have either taken classes at the velodrome, hold a racing license, or have proven themselves capable of handling the racing. After the moto-paced warm-up, the Cs race against the Cs, the Bs against the Bs, and the As against the As and open division in the various types of formats listed above. There are no age limits and men and women mostly race against one another. On any given Tuesday evening you can see some former world champions and Olympians racing against local hot-shots. Some of the strongest racers are over 50 years old and have no problems hanging with the young legs. Finally, the San Diego Velodrome Association, mindful of their public trust, supports recovering wounded warriors at Balboa Hospital by inviting them to the development classes that are held during the week to train racers. The SDVA is also involved with the Velo Youth Program, which uses cycling to educate at-risk and needy youth on health and fitness. Come spring, grab a date, grab a pizza, and come up to the San Diego Velodrome at Morley Field. Did we mention it’s free? You have to buy your own pizza though.